After spending almost a week in Kyoto, mom and I started jumping on trains for day trips to nearby cities. Our first Kyoto day trip destination was Osaka, and let’s just say the challenge of that city totally overcame me. We couldn’t seem to find a single attraction without getting hopelessly lost, and by the time we decided to call it a day, we hadn’t experienced half of the working man’s town I had hoped to see. I’m not going to devote an entire post to that day because… well frankly, I wouldn’t enjoy writing it and you wouldn’t enjoy reading it. But I fell asleep that night feeling supremely disappointed in myself. Fast forward to the next morning, and mom and I are getting off the train in Nara – day trip number two. Immediately outside the station was a visitor center staffed with an exceptionally genial man who seemed to truly enjoy his job of orienting foreigners and immediately provided us a map and an explanation of how to get around his beautiful city. The bus stop was just across the street. Minutes later we were getting off the bus in Nara Park. It was so easy I wondered to myself if it was too good to be true. Surely we couldn’t be at our destination so quickly, and right on the first try no less? But it was true. We had made it. 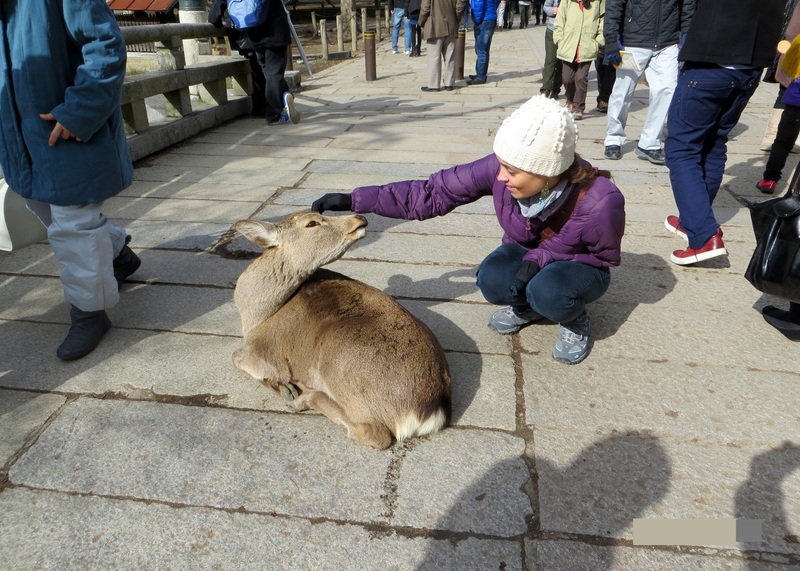 Already, I loved Nara. 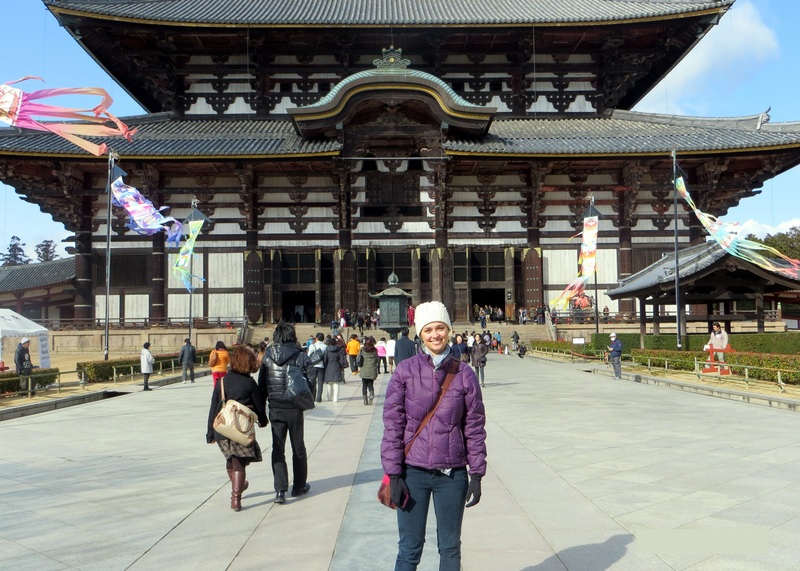 We had come to Nara to visit the Great Buddha of Todai-ji. 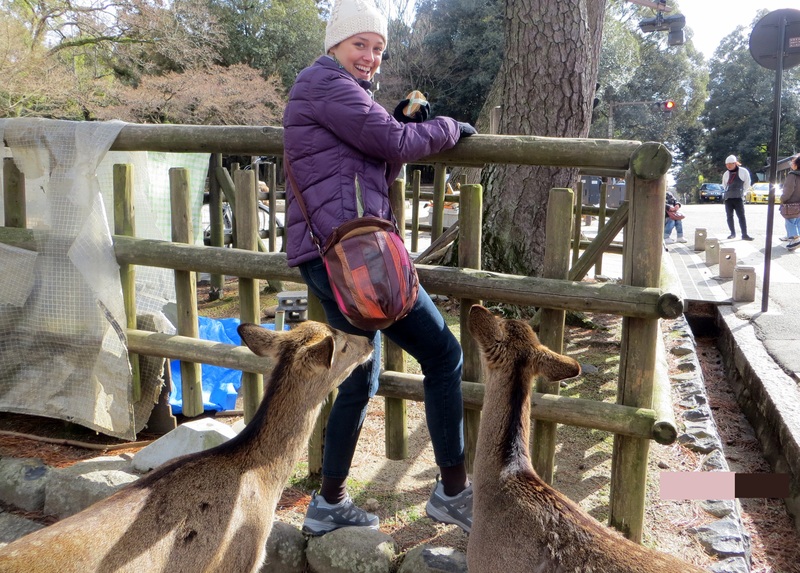 But first, we had to make our way through Nara Park – and that meant making acquaintance with the park’s most famous residents. It is said that long ago the god Takemikazuchi arrived in Nara on a white deer in order to protect the city – at the time the newly establish capitol of Japan. 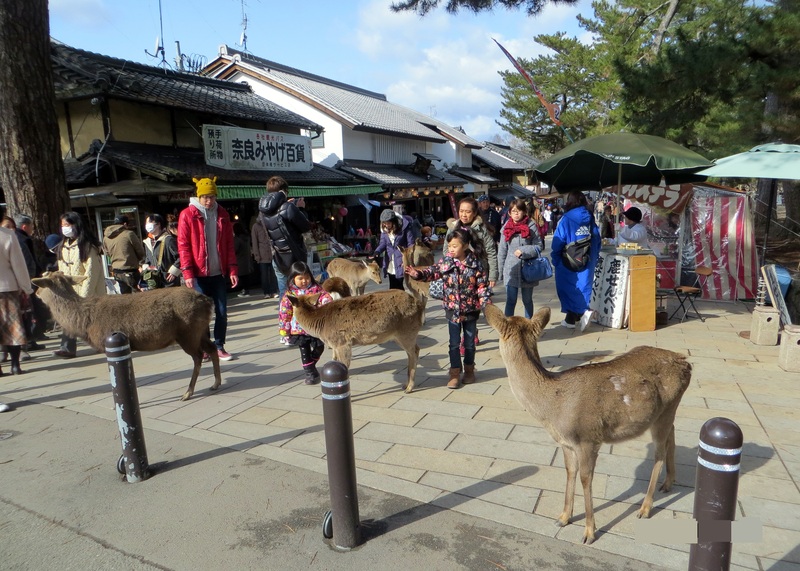 Ever since then the deer in Nara have been regarded as sacred, and they roam the park freely in large numbers without any fear of humans. 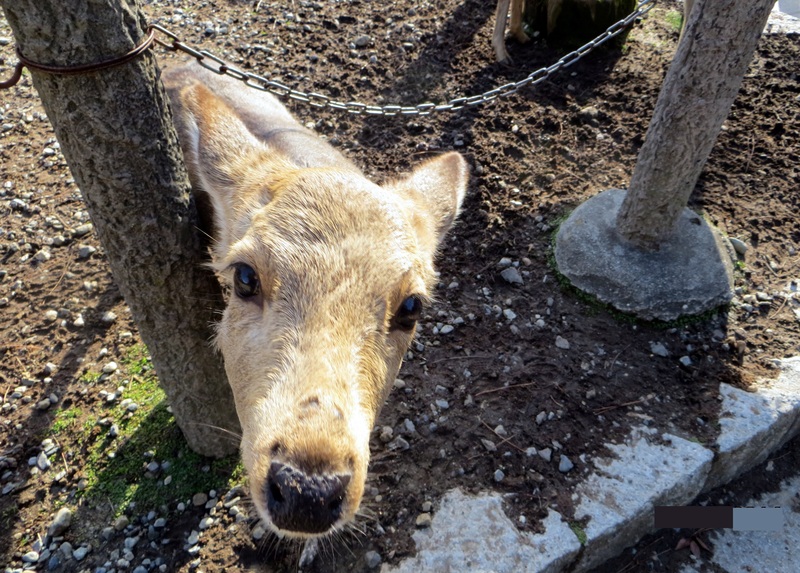 At the entrance to the park stood a cart selling crackers for tourists to feed to the deer. For a split-second the park ranger in me was horrified. Where I come from, under no circumstances do you ever feed the wildlife. But the scene unfolding ahead quickly changed my mind. 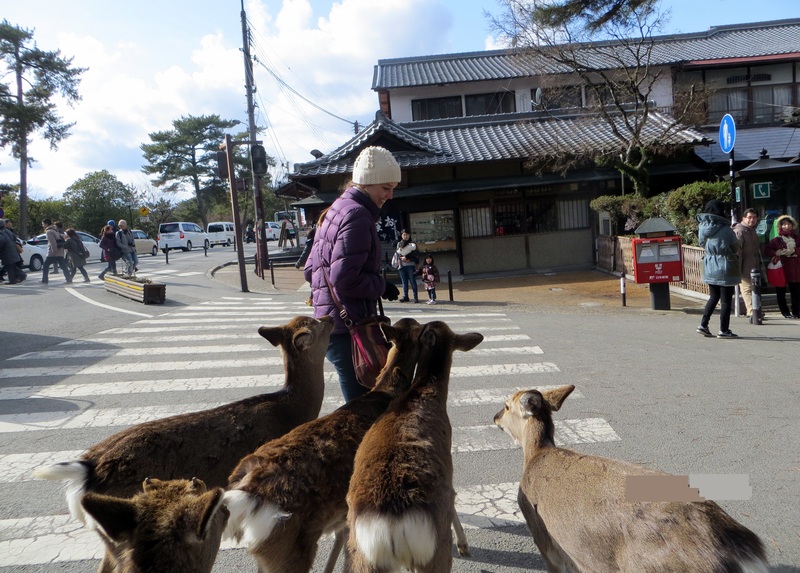 The Japanese perspective on these deer was clearly much different than that of the animals I vow to keep wild back in the states. Within seconds mom and I were purchasing a stack of crackers. When in Japan right? There were already a crowd of deer huddled around the cart, appearing mysteriously apathetic to the stacks of crackers sitting in front of the smiling vendor. But their demeanor changed immediately the second the crackers reached my hand. Once placid, the deer came together and aggressively surrounded me – nipping at my pants, my purse, and my jacket to get to the crackers in my hand. Bound by a piece of paper, I hurried to break it apart so as to distribute the crackers to this horde of bullies. But the deer were impatient and relentless, and before I knew it I was attempting to climb fences, running down the street trying to buy myself the time to unwrap the crackers. I may look happy in the photos, but actually I was terrified. Eventually I was able to fumble the wrapper open, and it wasn’t long after that that my attempt to distribute one cracker at a time was abandoned. A particularly brazen deer grabbed the whole stack from my hand and threw it to the floor. I was simultaneously disappointed and incredibly relieved. Scenes such as this continued to unfold around us as we made our way to the temple. Children squealed in delight as the deer approached to say hello. Tourists posed for photographs. Without the crackers, they were significantly less terrifying – even sweet. Eventually the gate to the temple revealed itself in front of us, and we fell in line with the hordes heading to see the most famous attraction in Nara. The pamphlet we received with our tickets told us that the temple housing the great Buddha was the largest wooden building in the world. A little internet research later informed me that actually, Todai-ji lost that title in 1998. But it was still pretty impressive. Especially when you consider that the temple that stands today, finished in 1709, is actually 30% smaller than its predecessor, which was destroyed twice in fires. 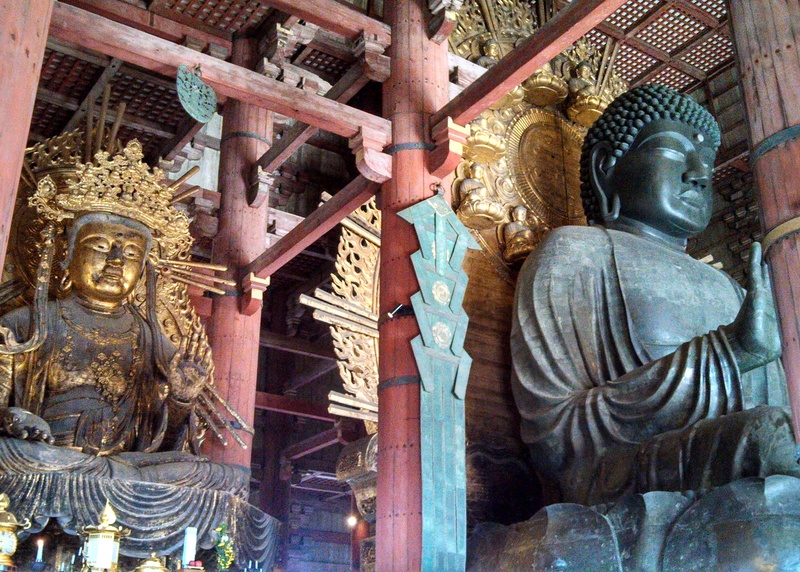 Inside the structure stood the Daibutsu – the world’s largest bronze Buddha. 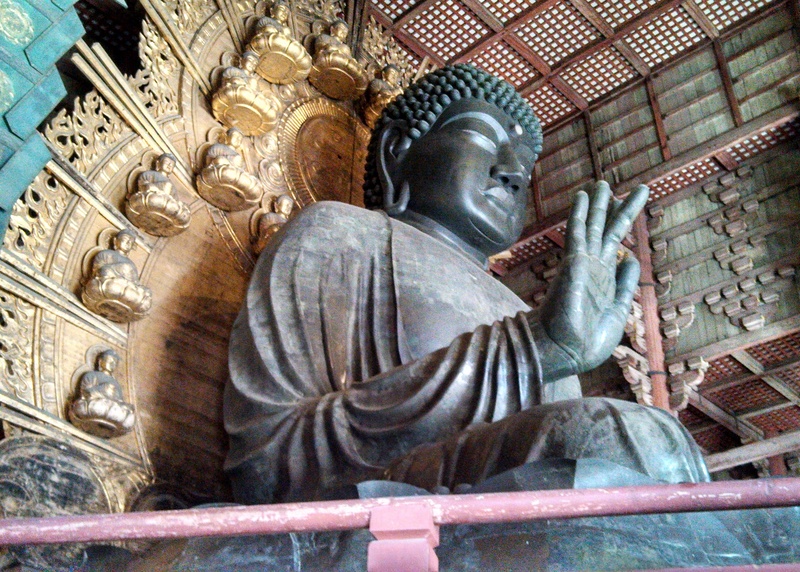 Wikipedia says that this Buddha is 49.1 feet tall, but dimensions alone don’t do this great Buddha justice. Standing in his presence, he is colossal. 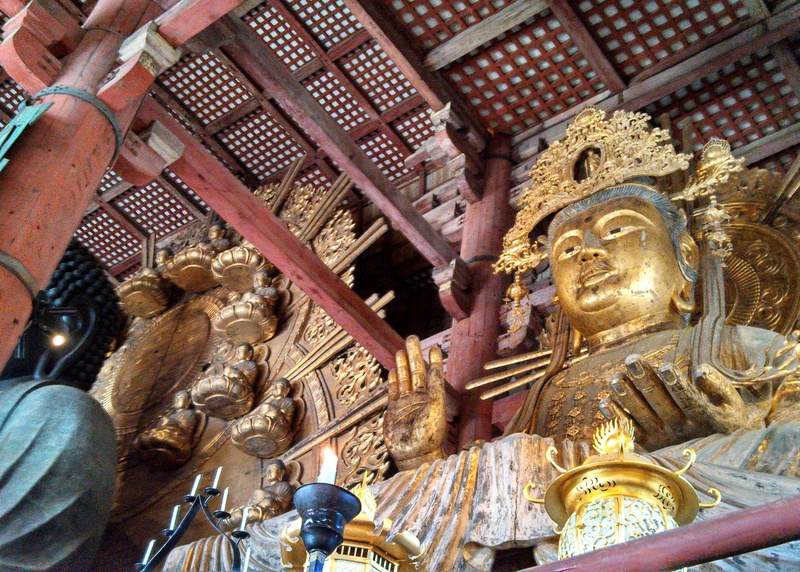 Other giant statues in the temple include two of the hall’s guardians and two golden Bodhisattvas. 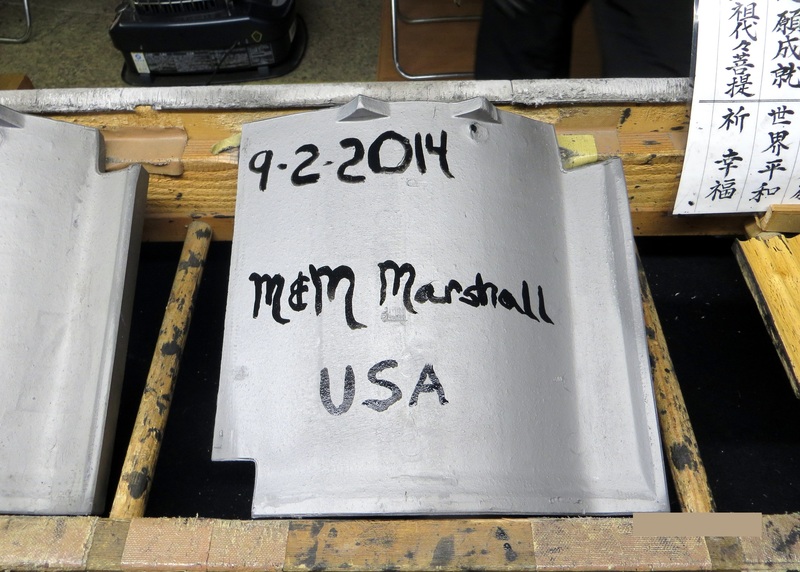 About halfway through our walk we came upon a booth with roof tiles and paint set up. 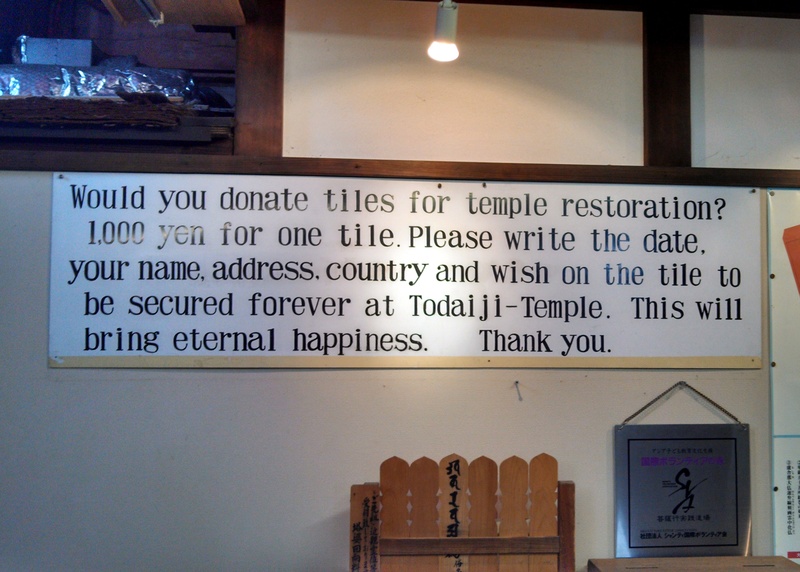 A sign asked for a donation in exchange for an opportunity to paint the tiles and eternal happiness. 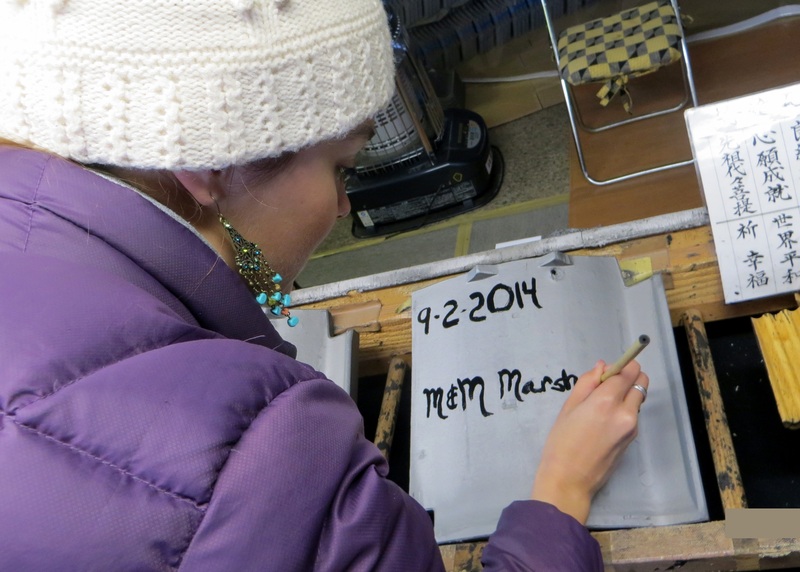 Painting and eternal happiness for 1,000 yen? Who could turn that down! In truth, we were happy to contribute to the restoration of what was to us easily the most magnificent temple we visited in Japan. It turns out our scratchy English characters weren’t nearly as beautiful as whatever poetic prose the Japanese tourists on either side of us painted, but it’s neat to think that our tile might shelter these incredible sculptures one day just the same. 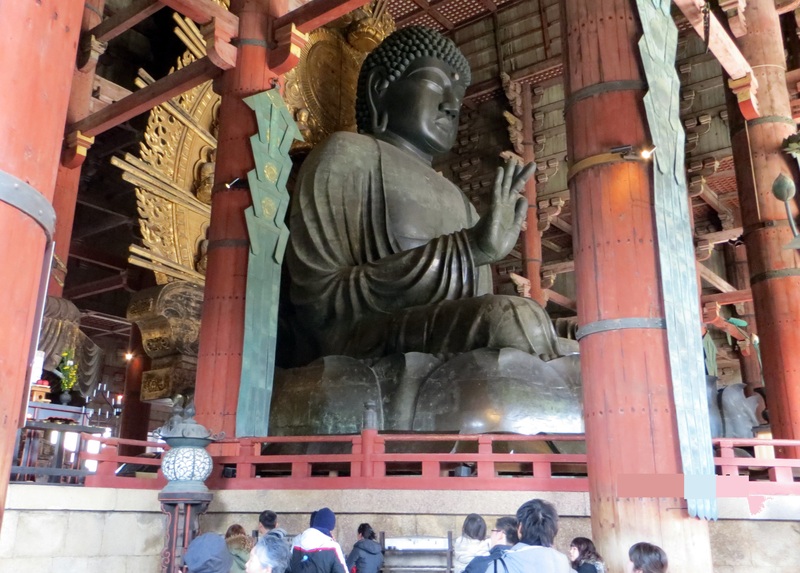 The Great Buddha of Todai-ji may very well be the most impressive sight we saw in Japan. I only wish my photos were better so that you could be so awed too. I feel like I was there enjoying it with you! The pictures are great!! and the truth is that I feel I was there too….Beautiful and funny!